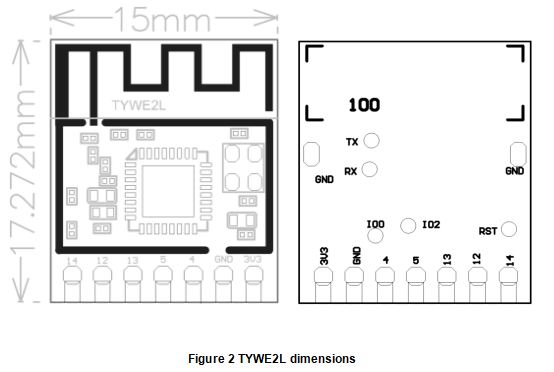 ​ TYWE2L is a low power-consuming built-in Wi-Fi module developed by Hangzhou Tuya Information Technology Co., Ltd. It consists of a highly integrated wireless radio chip (ESP8285) and several peripherals, with a built-in Wi-Fi network protocol stack and robust library functions. 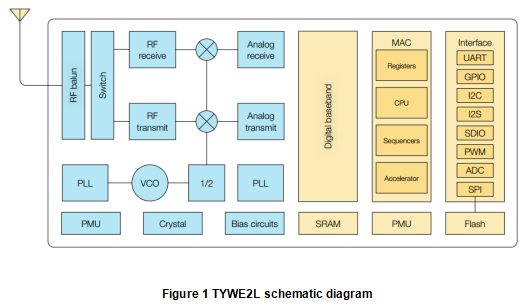 TYWE2L also provides a low power-consuming 32-bit CPU, 1 MB flash, 50 KB SRAM, and various peripheral resources. TYWE2L is an RTOS platform that integrates all the function libraries of the Wi-Fi MAC and TCP/IP protocols. Users can develop embedded Wi-Fi products as required based on the function libraries. 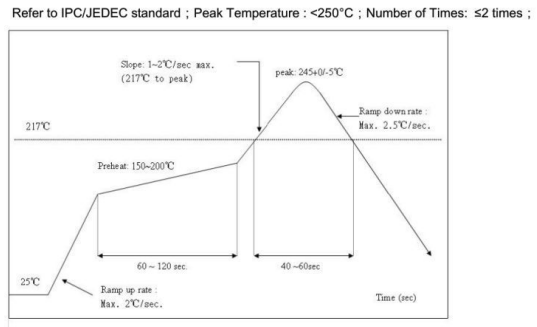 ​ Figure 1 shows the schematic diagram of TYWE2L. 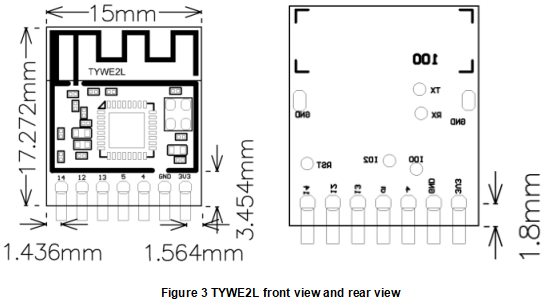 TYWE2L provides two rows of pins with the distance of 2.0 mm between every two pins. Table 1 describes the interface pins. Note: P indicates power-supply pins and I/O indicates input/output pins. Table 2 describes the test pins. - IO0 I/O IO0 is involved in module startup. If IO0 is disconnected, the module enters the normal running state. Note: I/O indicates input/output pins. If IO0 is disconnected, the module enters the normal running state. If IO0 is in low level, the module enters the firmware programming state. Test pins are not recommended. ​ TYWE2L uses the onboard PCB antenna. ​ To ensure optimal Wi-Fi performance when the Wi-Fi module uses the onboard PCB antenna, it is recommended that there be a space of at least 15 mm between the module antenna and other metal parts. The anti-moisture bag is placed in an environment where the temperature is under 30°C and the relative humidity is under 85%. The shelf life of a dry-packaged product is six months from the date when the product is packaged and sealed. Throughout the production process, each involved operator must wear an electrostatic ring. During the operation, strictly protect the module from water and strains.